Neem oil is loaded with powerful antioxidants, which provide protection to our body from harmful free radicals as well as environmental factors. The vitamin and essential fatty acid contents of this oil are also quite high, which makes it easy-to-absorb and helps in increasing the suppleness of the skin by invigorating it. All these result into a smooth, blemish-free and youthful skin. If you have long been suffering from dry and itchy skin, neem oil can help you a lot by moisturizing it deeply. Therefore, you can get rid of flakiness, cracks and freckles and achieve a healthy as well as evenly toned skin. Be it acne (and all other sorts of breakouts) or the scars left by it, neem oil can help us get rid of both of them successfully. It has been found to contain certain chemical compound, which is almost similar to aspirin and hence, can destroy acne causing bacteria. Conversely, the essential fatty acids of the oil reduce the scar marks left by the breakouts. As a result, the skin becomes free from pimples, its redness and its scars. Regular application of neem oil can regulate the abnormal production of melanin pigment in our skin, thereby reducing ugly pigmentation significantly. It also adds a freshness and natural glow to the skin. 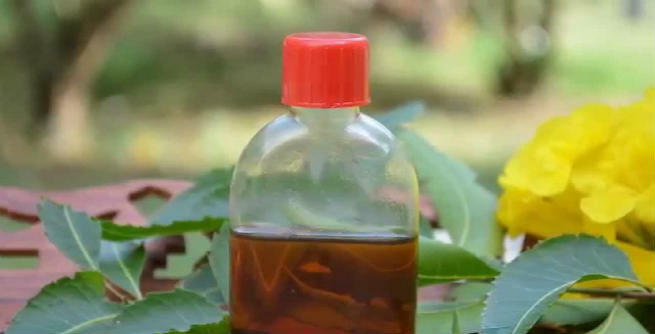 Well, neem oil cannot cure eczema completely, but it can ease the symptoms of acute eczema quite efficiently. It has great antiseptic properties, which prevent the infection from getting spread. Being rich in essential fatty acids and vitamin E, neem oil can work easily on the deepest layer of the skin without affecting its protective barrier and retain its natural moisture content. The oil also contains compounds like nimbin and nimbidin, which reduce redness, swelling, inflammation, etc. and make healing faster. Neem oil is considered as a wonderful treatment for fungal skin infections. The nimbidol and gedunin content of this oil contribute to its strong antifungal properties, which can fight against almost 14 different cultures of fungi and heal diseases like athletes foot, nail infection, etc. Neem oil helps a lot in maintaining the standard pH level of our scalp. It keeps scalp healthy by treating issues like dryness, itchiness, psoriasis, etc. Reduction of all these problems eventually gives us dandruff-free locks. If your hair is dry, rough and frizzy, massage it with neem oil or simply add a few drops of the oil to your regular shampoo. This will condition your rough and unmanageable locks and make them silky smooth. Massaging the scalp regularly with diluted neem oil can make it healthy, which eventually gives us beautiful, shiny and problem-free hair. Be it dandruff or any health disease, the volume of your hair can be affected severely in all the cases. But regular application of neem oil can keep all negative factors away, thereby promoting the growth of healthy hair to a great extent. Apply neem oil all over your scalp and leave for the whole night. Make it a regular practice to get rid of irritating head lice that can also lead to a number of scalp issues over time. So, when are you going to use neem oil for pampering yourself?